I have written about several restaurants on this blog which are stuck in time yet still hold on to their charm and enhance the dining experience. Crown Palace does not qualify as one of those places. It is not dirty, or even ugly, but you walk in and the atmosphere just screams 1990’s, mainly because the last time I was there was when I was about seven or eight years old and it looks and smells exactly the same as it did back then. The reddish-pink light that runs the perimeter of the ceiling gives the restaurant a nice nightclub-like glow, but the decor and those God-awful and brutishly uncomfortable banquet chairs just leave you awestruck. This place needs a revamp. 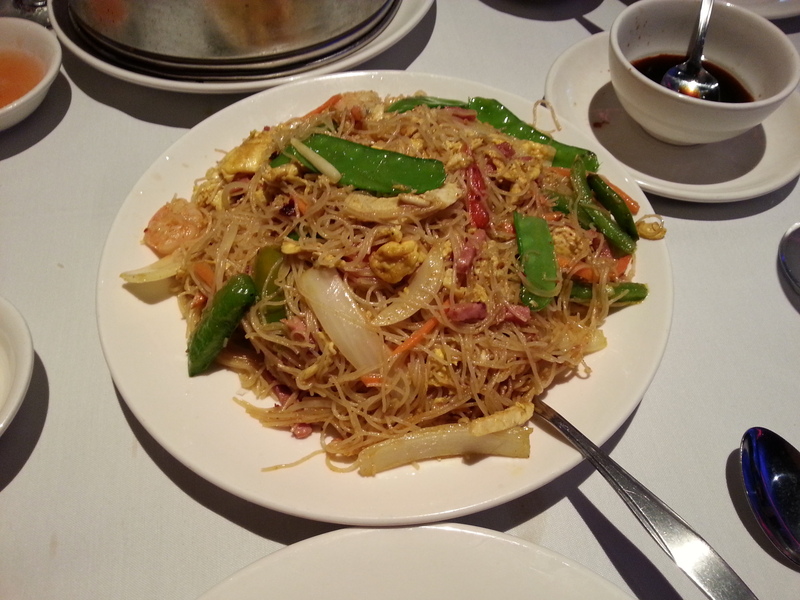 The food is just average Chinese food; not bad, but nothing standout either. The bar when you first walk in is beautiful, but alas, there is no one there to sit there and drink. The dining room, though enormous, was so empty on a Friday that you could shoot a cannon through there and not hit anyone. Hey, people in the Hazlet/Middletown area, remember when this place used to be rocking? Remember when you had to wait for a table and the bar was packed with people ordering Mai Tai’s just because the wait was so long? Remember nearby Ruby Palace in Holmdel, which had the same situation? Packed parking lots and equally packed dining rooms. Those days, for better or for worse, are long gone. Ruby Palace has been out of business for what seems like forever, and Crown Palace is hanging on. Supposedly, they are packed for Dim Sum on Sundays, and as the one and only real sit-down Chinese restaurant within (I estimate) at least 20 minutes, I guess they will stay in business for that very reason. To start with a drink, I ordered the ubiquitous Mai Tai, something I always stay away from because of how easy it is to fool around with. But I really felt like one, and the $6.95 price was listed (as was the case for all their drinks), so why not? It ended up being okay. You’re going to see I echo that sentiment a lot in this review. I suppose there was a fair amount of rum, but I tasted nothing but pineapple. The glass was large and there was little ice, which meant the drink was substantial. However, due to the lack of ice, that also made it borderline warm. At least that stupid umbrella toothpick made it looked beautiful. 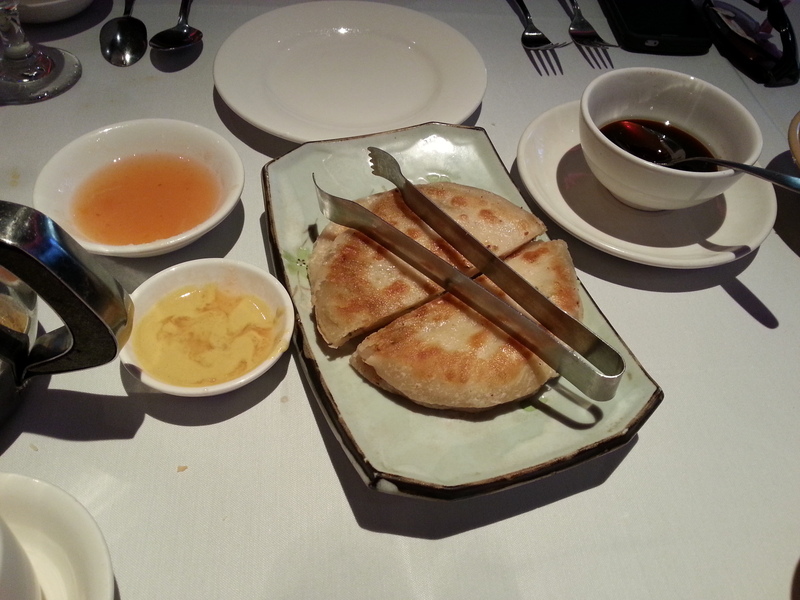 For an appetizer (along with the complimentary fried noodles and duck/mustard sauces), we got the scallion pancakes. There were two, not overly impressive. They managed to be slightly crispy and not greasy, but were so doughy that it was hard to taste and find the scallions. 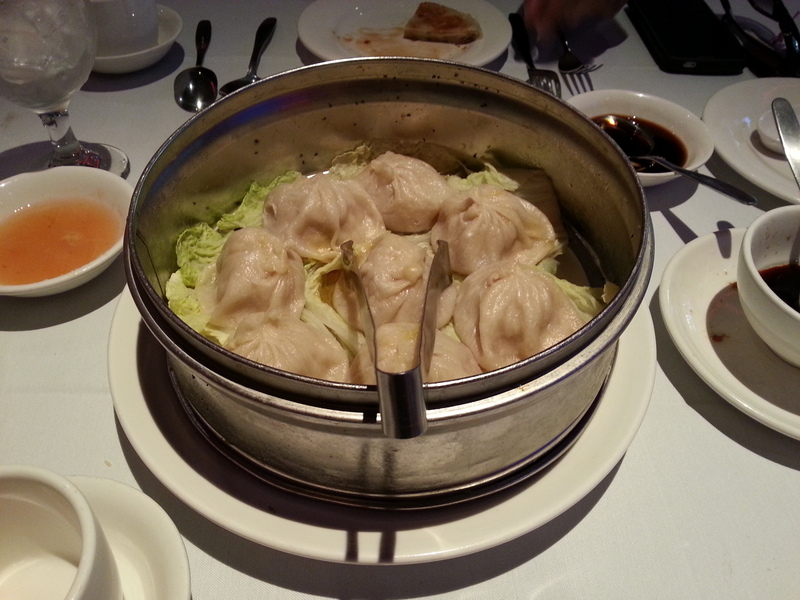 For his meal, my friend John ordered the crab dumplings, which the menu card said were only offered on Sundays, but he asked and they said they could make them. He thought they were great, while I thought they were—you guessed it—just okay. Bonus points for using real crab and not imitation. My meal was the Singapore Mei Fun, which was thin rice noodles with curry flavor. I asked for extra spicy, and they did a mediocre job on the heat. It was not greasy, and there was a good amount of shrimp, chicken, and pork, but it left me underwhelmed. Would I come here again? Probably not. I almost did not know what to make of it, because I don’t think I have ever had such an “average” experience. The service was not bad (there was one younger waiter who was cracking jokes, smiling, and seemed to be having a good time), and the older tuxedo-laden servers were probably the same guys who were there when I was a little kid. Be advised: only come here if you are really craving that old-fashioned sit-down Chinese dinner. If not, stick to takeout at your favorite local greasy spoon joint. I know I will for the time being. 3 out of 5 stars. Crown Palace is located at 1285 State Route 35 in Middletown, New Jersey.